OK... what kind of idiot thought this would be a useful device? I guess walking is out of the question? They already have that in the world,it's called a bicycle. Imagine if 10 or maybe even 100 people were all running on that thing! ofcourse a larger one. Warp speed!! THROW IN MORE PPL! AND! The inventor ripped off the hamster! Whats wrong with just RUNNING? instead of running on that..they can pull the rikshaw in china..! sorry the bicycle version is much much more stupid!!!!!!!!!!!!!!!!!!!!! i do not intend to use correct grammar and correct words, because i am already stoned. OMG, what in the hell was the guy thinking ? ain't he got any friends to tell him what a dumb idea that was ? oh well, more fun for us. Ha ha ! Things to do when you get bored!! The song is kinda similiar to hill street blues. Aaanyway, crappy song. Alex Astilean should have the next darwin award... Because, now is the time to invest! Perhaps the best slogan in this galaxy. also, if you fall of the back of it, would it just keep on rolling away down the street ? "now is the time to invest" maybe.... but not on that! On the surface it may seem like a stupid idea, but it does have the potential to make running more efficient. A person would still have the benefit of physical activity, but it wouldn't take so long as to be impractical. 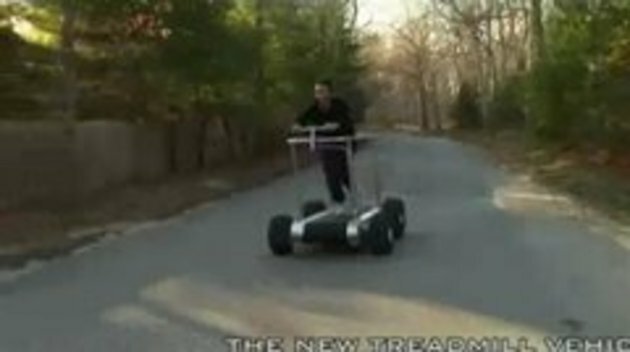 The machine could also carry items like groceries, which would also be more practical than an non-enhanced run.